"Bluegrass" - tha e ri lorg air na Blue Ridge Mountains, tha mi a' creidsinn. Dhì Haidh! As to the Shades of... article, that's purely based on physics, not on perception. Any mix of yellow and red is a shade of orange, and any mix of the three primary colours is a shade of brown or grey. GunChleoc wrote: Any mix of yellow and red is a shade of orange, and any mix of the three primary colours is a shade of brown or grey. 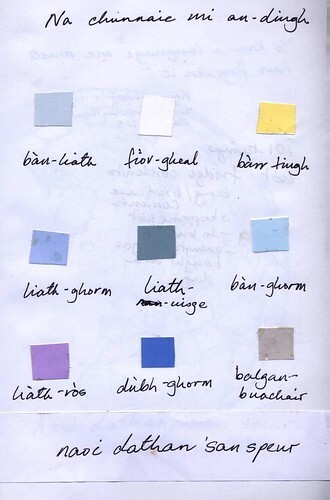 Seonaidh wrote: Dè na dathan "primary" - Dearg, Buidhe is Gorm no Dearg, Uaine is Gorm? Chan eil e gu diofar a thaobh na thuirt mi, dh'obraicheadh an dà chuid. Dh'obraicheadh fiù 's cyan, magenta agus buidhe nam biodh tu a' cleachdadh am model CMYK. Tha dè an seòrsa donn a gheibh thu a' crochadh air dè cho làidir 's a th' anns gach fear agus is dòcha gum faigh thu glas. Tha mi air bruidhinn air na gheibh tu a thaobh saidheans co-dhiù seach ciamar a bhios na daoine a' faicinn nan dathan anns na diofar cànanan. Chunnaic mi dealbh inntinneach o chionn ghoirid. Saoil am bidh i feumail don deasbad a tha seo? 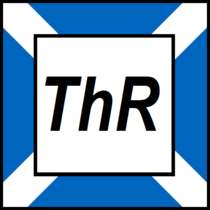 Cha robh mi eòlach air Theory of Colours le Goethe ach leugh mi an t-aiste agus tha e coimhead dhomhsa gu bheil ùidh aige ciamar a bhios daoine a' faicinn nan dathan, ged am b' e sin saidheans cuideachd mar a chunnaic e sin. Ach eadhon nam biodh gach measgachadh de Gelb, Rot is Blau a' cruthachadh tuar de Brün no Grau, cha chreid mi gum biodh sin a' ciallachadh gum feumadh gach measgachadh de bhuidhe, dhearg is ghorm tuar de dhonn no ghlas a chruthachadh, mar a tha na Gàidheil a' tuigsinn nam faclan. A thu cho ceart sa ghabhas air seo. Tha prògram buntainneach (mu mhothachadh nan dathan) air iPlayer an-dràsta (airson 12 latha fhathast), gu h-àraidh an earrann eadar 45:30 is 50:15. They basically separate the shading range among various strains. On the staggering part, I've run the standard shading swatch test past neighborhood speakers and "the present Gaels" separate the range excatly like English speakers do. Adjacent to the geal/bàn, dearg/ruadh split of way which is revolved around material.